- Worsted weight yarn - approx. 80 yards skin tone color, 200 yards white, 50 yards turquoise, 50 yards hair color(s), scrap amount of yellow. My doll measures 10” tall (minus the horn) when made with the above materials. All of my patterns are tested and checked for errors, however sometimes things get missed, so please feel free to contact me should you encounter any errors in the pattern, or if you need any assistance. R22: Stuff arms, leaving the top unstuffed, 4 sc across both sides of the top of the arm to close. R8: sc dec, 7 sc, sc dec x 2, 7 sc, sc dec (18) Change to white on the last st of this round. Part 2 will be joining the legs and crocheting the body. Stuff body and fasten off white. R3: Ch 1, (dc, tr) in same st, tr x2, (tr, dc) in next st, (dc, hdc) in next st, hdc inc x2, (dc, tr, dc) in next st, hdc inc x2, (hdc, dc) in next st, (dc, tr) in next st, tr x2, (tr, dc) in next st, sl st.
Fasten off with long tail. Sew to the body. Part 3 will be crocheting the head and adding a face to your doll. Insert neck support if you are using one, otherwise stuff as firmly as possible. You can use foam hair rollers, popsicle sticks, plastic spoon, or crochet a tube the diameter of the neck and insert that. All of these methods will help prevent a bobble head. Insert safety eyes between R12-13, 8 sts apart. Embroider eyelashes. Stitch a nose using skin tone color between R11-12. Add blush to cheeks if desired. R9-16: 48 sc (48) Change to turquoise on last st of R16. Fasten off with long tail. Sew the hat to the head. Fasten off with long tail. Flatten ears (do not stuff) and sew to the hat. Fasten off with tail. Stuff and sew to the hat. Fasten off with tail. Sew 12 down the hat for the mane – in 2 rows of 6. Sew 4 to the body for the tail. Fasten off with tail. Sew 2 on either side of the horn. Thank you for posting this pattern. I love it so far! I just have a minor problem with joining the legs to the body, but I am getting there, slowly but surely. Take care. Are we not allowed to print this pattern then? 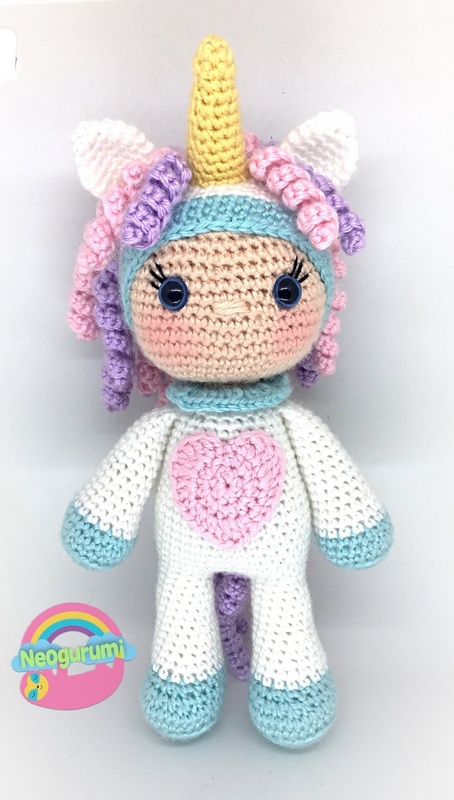 Thank you so very much for sharing this pattern with us , gotta make this for my granddaughter. Once again Thank You. Congrats for the beautiful job! I do not understand how to make the Long and short curls. Only chains? Chain and then turn and crochet up the chain. HI, thank you for sharing this pattern. Could you let me know which yarn you used for the head? Thank you. Beautiful doll, my grand daughter will love her. Thanks for sharing your pattern. Merci, pour cette adorable poupée, une superbe idée. Amei o seu trabalho. Muito obrigada por compartilhar. I have enjoyed making this for my great granddaughter. It's a Christmas present. I think she is going to enjoy this one most of all. Thank you so much. This pattern is so quick and easy. Thank you so much for sharing this easy to follow wonderful pattern. 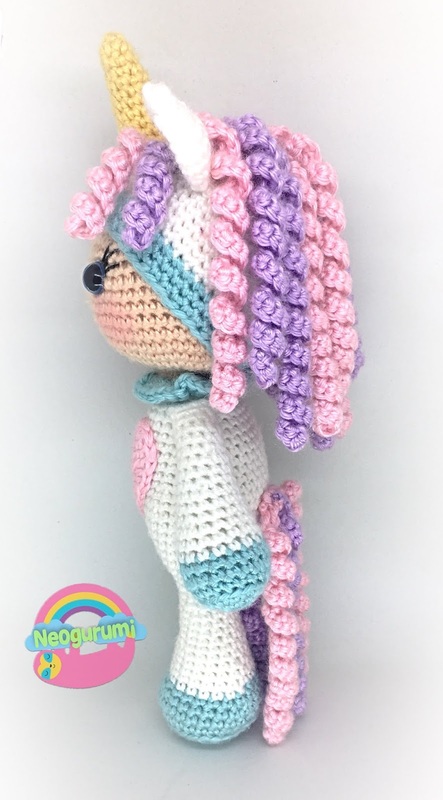 My daughter loves her new unicorn girl I made her for her new unicorn/fantasy room. In a week or so there will be a blogpost about her on my blog. I love this pattern so much! I'd just suggest making sure to let people know if it's continuous rounds or slip stick at the end of some rows. 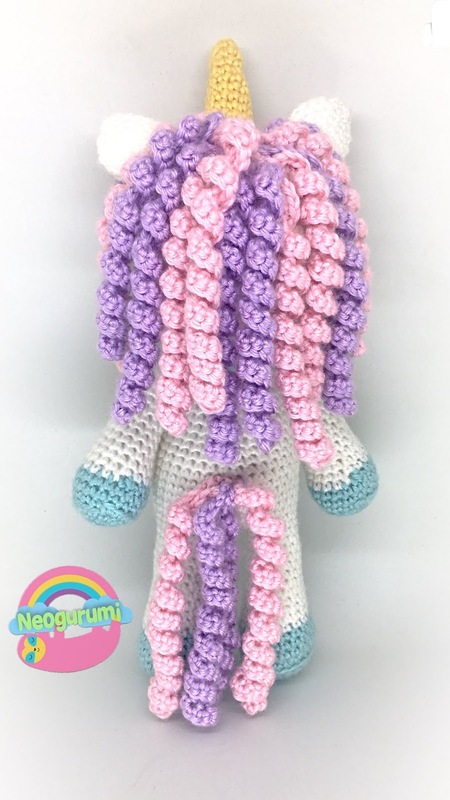 I will say though, I've learned a bunch by following this, the legs specifically, I've been crocheting them and just sewing onto the body....not anymore! Thank you!